Learn more about graymail, and how to improve your engagement rates with HubSpot's graymail suppression feature. 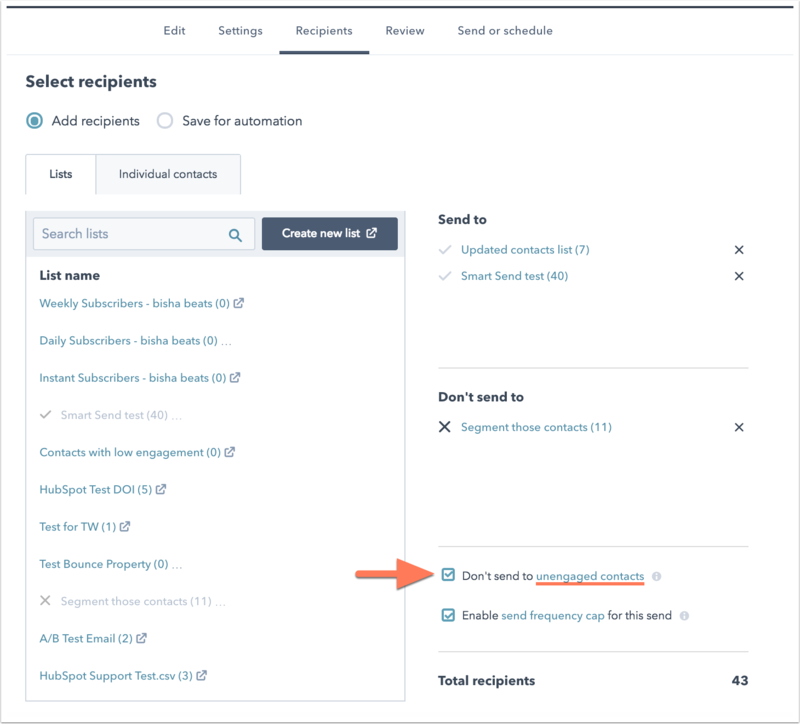 In the Recipients tab of your marketing emails, select the Don't send to unengaged contacts checkbox to automatically exclude contacts who aren't interacting with your marketing emails. Graymail is email that contacts have opted in to receive, but never open or click. Spam filters can identify and filter out emails that your recipients aren't opening or clicking. This increases the likelihood that future emails will end up in the junk folder or spam filter. By continuing to send email to contacts who don't open or click, you're lowering your sender score overall. How does HubSpot calculate unengaged contacts? Never opened a marketing email from you and hasn't opened the last 11 emails you've sent them. Previously opened a marketing email from you but haven't opened the last 16 emails you've sent them. You can also see a complete list of contacts that will be excluded from a specific email. You can enable or disable the Don't send to unengaged contacts feature by default in your settings. The Don't send to unengaged contacts toggle will be switched on by default. 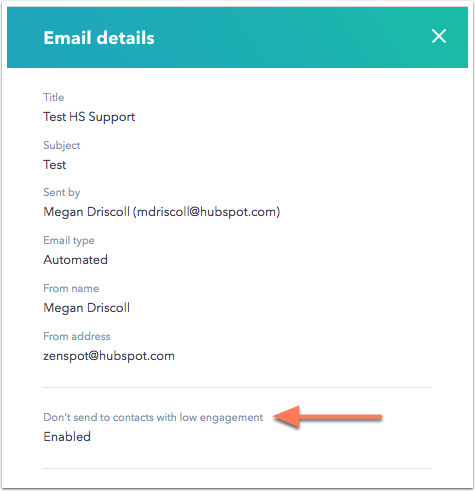 Switch the Don't send to unengaged contacts toggle on to enable this feature for newly created or cloned emails by default. You can enable or disable this setting for an individual marketing email. This includes email sent immediately to recipients as well as emails that are saved for automation. Hover over an existing email and click edit or create a new email. Select the Don't send to Unengaged contacts checkbox to enable this setting. To see a complete list of recipients that would be excluded with this feature enabled, click unengaged contacts next to the feature checkbox in the Recipients tab. You can see whether the Don't send to contacts with low engagement setting was Enabled in the email details. You'll also see these contacts in the Not sent tab of your sent marketing email.